Locate and position the mounting bracket next to the lower side of the window opening. The bracket is narrower than the shutter, which will leave a space between the window opening and the end of the mounting bracket. Center the bracket to the shutter width. Using a level, verify that the mounting bracket is level, then mark the position of the two slots on the wall. The slots in the mounting bracket will allow for some minor adjustment in the vertical position. With the slots properly marked on the wall, drill a 1/4” diameter hole 2” deep at the center of the marked slots. In each of the 1/4” holes, place one of the alligator wall anchors. These anchors are suitable for mounting into concrete, aerated concrete, brick, masonry, stone, cinderblock, stucco, or wood. Gently tap the head of the anchor until it is flush with the wall. Place the bracket up against the wall and locate the anchors through the mounting slots. Drive the 2” screws through the slots and into the alligator wall anchor. The anchor will expand in the wall and is not capable of coming out. However, the anchor may be reused if adjustment of the screw depth is necessary during the initial installation. Make sure the bracket and mounting screws are secure onto the wall. Level the bracket and tighten the screws. Place the shutter on the lower bracket and stabilize the shutter so it cannot tip off. 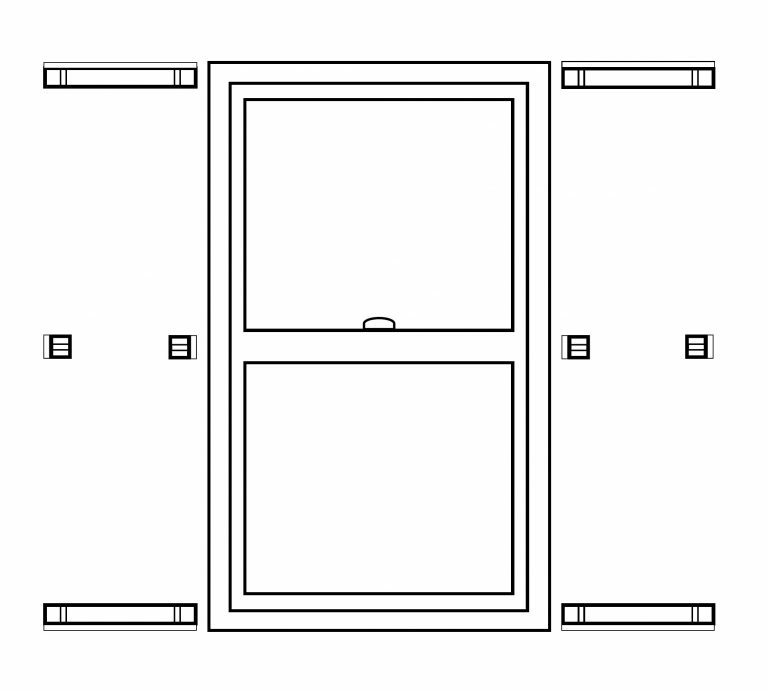 Take the second mounting bracket and locate the correct position at the top of the shutter by drawing a line to locate the height. Remove the shutter carefully. Place the bracket on the wall and mark the two slots in the desired location. Repeat steps 2 & 3 to complete the installation of the mounting bracket. Place the shutter up against the wall in desired position. The lower mounting bracket will support the weight, but be sure to stabilize the shutter so it does not tip off. Mark the location of the holes in the brackets to the top and bottom ends of the shutter. Remove the shutter from the wall and drill a 9/64” diameter hole, 1” deep into the ends of the shutter in the 4 marked locations. Make sure to drill the holes perpendicular to the shutter so as not to breakthrough the surface of the shutter. Place the shutter back on the wall and line up the holes in the bracket to the holes in the shutter. Drive 3/4” mounting screws into the pre-drilled pilot hole until the screw is snug. Make sure not to over tighten the mounting screw, which may cause the material to strip out. Repeat this for each of the mounting screws, two per mounting bracket. The shutters are now properly mounted. Remove the shutter from the wall. Find the center of the shutter and place a mark on the shutter. Align your side bracket to the center of the shutter and place your shutter between the upper and lower brackets on the wall. Be sure to stabilize the shutter so it does not tip off. Mark the outside edge of the bracket. Hold the side bracket on the wall, remove the shutter and mark slots on the bracket. With the slots properly marked on the wall, drill a 1/4” diameter hole, 2” deep at the desired location along the marked slots. In each of the 1/4” holes, place one of the alligator wall anchors. Gently tap the head of the anchor until it is flush with the wall. Place the bracket up against the wall and locate the anchors through the mounting slots. Drive the 2” screws through the slots and into the alligator wall anchor. The anchor will expand in the wall and is not capable of coming out. However, the anchor may be reused if adjustment of the screw depth is necessary during the initial installation. Make sure the brackets and mounting screws are secure onto the wall. Place the shutter up against the wall in the desired position. The lower mounting bracket will support the weight, but be sure to stabilize the shutter so it does not tip off. Mark the location of the holes in the side bracket. Remove the shutter from the wall and drill a 9/64” diameter hole, 1” deep into the side of the shutter in the marked locations. Put the shutter back on the wall and drive the 3/4” mounting screws into the pre-drilled pilot holes until the screw is snug on all brackets. Make sure not to over tighten the mounting screws, which may cause the material to strip out. The shutter is now properly mounted. Repeat steps 1-6 for the other shutters.